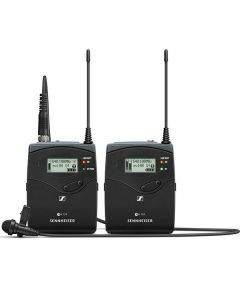 Rugged all-in-one wireless system with high flexibility for broadcast quality sound featuring SK 100 G4 Bodypack transmitter, EK 100 G4 camera receiver and ME4 clip-on microphone with cardioid pick up pattern. A broadcast quality sound solution. Providing the highest flexibility for your video sound and field recording applications. A robust wireless microphone system that offers excellent sound quality, simple mounting and ease of use.